US News & World Report ranked the Ford Expedition as the number one SUV in 2019. The latest model has heads turning with its sporty grill, but it’s the technology packed inside that has drivers truly entertained and protected. The Expedition received incredible praise for its luxurious cabin with tons of space and technology options. The latest base edition gets a ton of upgrades, such as four USB ports, 4.2-inch display, satellite radio, SYNC infotainment, and MyKey system. 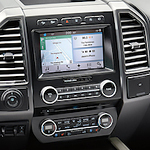 You can also add a ton of options to the Expedition, including SYNC 3 infotainment, which has Apple CarPlay, Android Auto, Bang & Olufsen speakers, HD radio, Wi-Fi hotspot, navigation system, wireless device charging, and rear-seat entertainment with two screens. The driver assistance features are also included with the upgrades, such as blind spot monitoring and lane departure assist. See what you’re missing with the latest Expedition and take a test drive today at Ron Carter Ford.